Robert Mondavi, the pioneer of California winemaking, would have been 100 years old this year. He may no longer be with us, but his legacy–the Robert Mondavi Winery–lives on with his family. His widow Margrit Mondavi, who is the vice president of cultural affairs at Robert Mondavi Winery, was on hand at a special dinner prepared by Chef John Sedlar of Rivera Restaurant in downtown Los Angeles to honor the life and legacy of Robert Mondavi. Sedlar is a longtime friend of the winemaking couple, having met them when he participated in the Great Chefs of Robert Mondavi Winery program, the first winery-culinary program in the United States, in 1988. Sedlar and Margrit told tales of kayaking together, 16 people in all, with 18 cases of Mondavi wine, and feasting on culinary meals prepared by Sedlar by candlelight on the shores of Snake River. Mondavi produced his first harvest in 1966, and created his signature Fume Blanc, recreated from Sauvignon Blanc, in 1967. Since the early days, the Mondavis were behind the culinary and wine movement for which Napa is now known. He was a great promoter of the winemaking region, and was willing to help anyone who asked, Margrit said. Scallops with lentils, broccoli, and celery. A dish prepared by Chef John Sedlar of Rivera Restaurant. 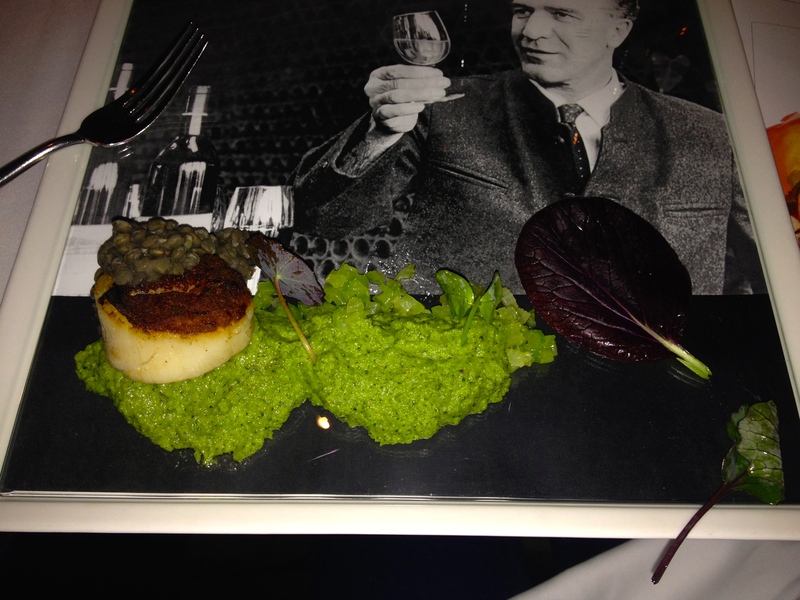 Dishes were served on plates that depicted images of winemaker Robert Mondavi throughout his career. The Salmon Mousse Tamal with the Cacahuate Salsa was another favorite. The tamal was the perfect texture–not too dry and not too wet–and the salmon was not overpowering. Salmon Mousse Tamal with Cacahuate Salsa. A dish prepared by Chef John Sedlar of Rivera Restaurant. 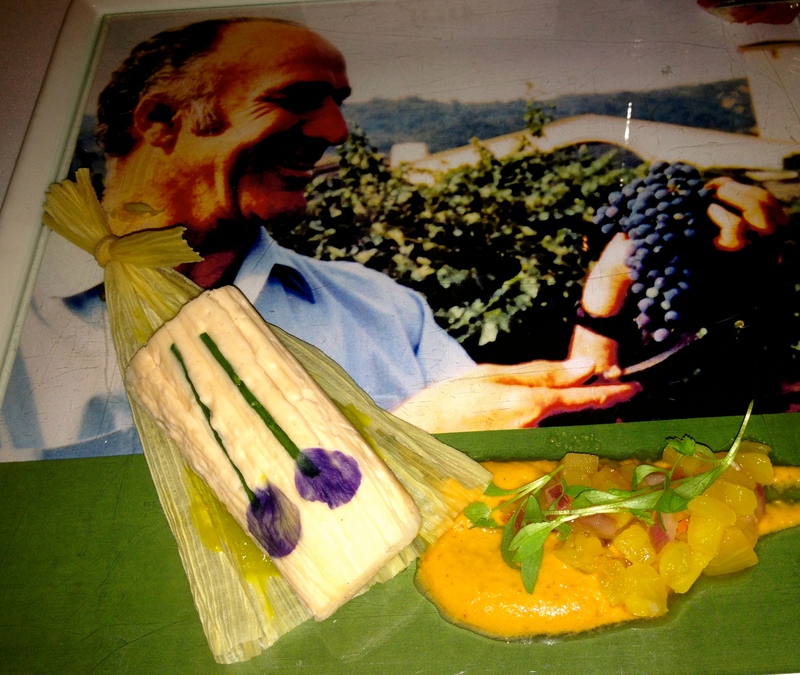 Dishes were served on plates that depicted images of winemaker Robert Mondavi throughout his career. The wines paired with the evening’s meal included a 2011 Fume Blanc Oakville, which was light and fresh, with just enough body to complement the tamal, and a 2010 Cabernet Sauvignon Reserve that, despite its youthfulness, was full-bodied with a smooth finish. Rivera Restaurant was the perfect fit to celebrate Mondavi’s birthday and legacy, given the long and close relationship between Sedlar and the Mondavis, as well as the level of cuisine and classy, yet comfortable ambiance. More information about Rivera. More information about Robert Mondavi Winery.